Tom Doherty (Colton Christensen) takes on a job on a remote Canadian island as the caretaker of a lighthouse. Shown around his new abode by mainland local Murphy (Cory Dangerfield), the owner of Murphy's Bar, a friendly chap who welcomes Tom to the island by telling him of the numerous deaths and weird goings on that have befallen previous caretakers of the lighthouse. Strange tales of madness, ghosts, suicide and wild beasts certainly make Tom uneasy but Murphy manages to convince him that these are nothing but tall stories and the strange occurrences do have explanations. However, it isn't long before Tom does start seeing ghosts, hearing screams, pleas for help and warnings coming from an unplugged radio. As well as what's happening inside the house when he goes outside he is convinced he is being hunted by what the locals call a "Hell Hog". 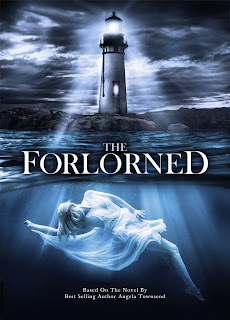 As he fixes up the house he finds clues as to what happened on this island to bring such evil, with the help of Amy (Elizabeth Mouton) the daughter of the previous caretaker they try to find a way to reveal the truth and lay to rest the lost souls caught up with the spirit that has been roaming since the 1800's. This movie is based on the novel of the same name by Angela Townsend which unfortunately I have not read so am unable to report on how true to the story this adaptation is but as a stand alone indie movie I really quite liked it. For a low budget movie I felt they put a lot of effort into creating an eerie atmosphere with not a lot to work with. The setting was effective. The effects and some of the cinematography were hit and miss, at one point the" shaky camera syndrome" goes one step further and turns into "spinning around really quickly camera" which adds little more than a feeling of nausea but thankfully only happens the once. The ghostly stuff in the house was perfectly fine but the chase scenes outside with the mysterious hog were a bit laughable. Christensen seems an unlikely (but cuddly) lead at first and does pull some really odd faces which, to some, may be slightly off putting but towards the end his character shifts and he totally channels his inner Jack Torrance to great effect, plus the devils food cake scene is something to behold and he has some funny dialogue. Dangerfield also puts in a great performance as the witty, jolly Irish bar tender. I don't think it has been received that well going by some reviews but I didn't mind this at all and would quite happily watch it again.